Startup Monday is ABCey’s weekly post that features some of the best and brightest companies. They are often companies that we have our eye on or have worked with in the past & would like to share with friends and followers of ABCey Events! Splacer is an online marketplace for renting out and listing creative event spaces for any occasion. This innovative group of architects’ goal is to bring together owners of unique spaces with people looking to create memorable event experiences. This Tel Aviv based company launched in fall of 2014, but announced last week that they raised $1.4 million in seed funding and are growing rapidly. How it works: Splacer is the AirBnB for event spaces. Event organizers can browse and discover listings using various filters and view venue photos. Owners can sign up with basic info about their space, get approved and instantly start renting. Splacer believes in creating a system of living that is collaborative, socially just and ecologically responsible. Be a part of their movement and sign up to list your space or find your next meeting, party, photoshoot or pop-up shop venue! 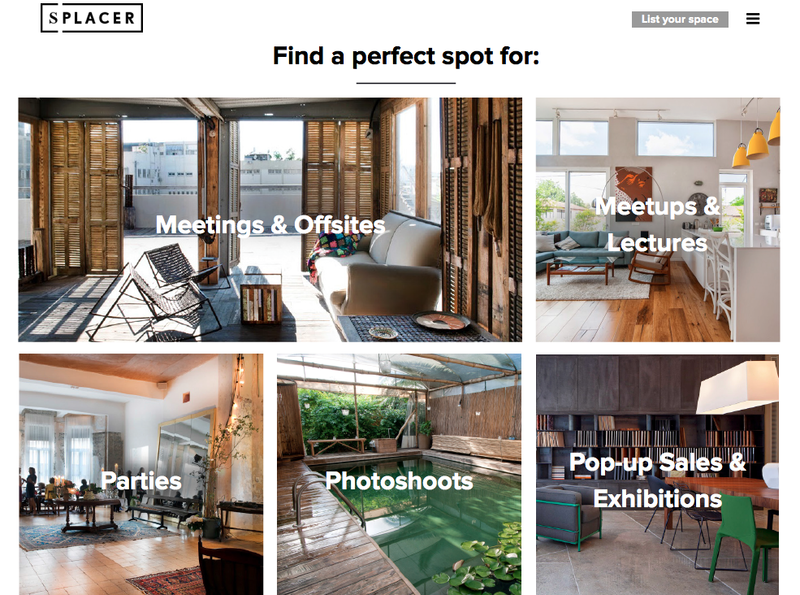 Will you be listing or looking for your next event space on Splacer? Let us know in the comments below or on Facebook and Twitter.